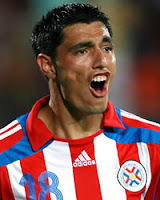 Newcastle are thought to be interested in securing the services of Benfica's Paraguayan striker Oscar Cardozo, after scouts from the club watched the player in action twice over the last month. With Benfica having spent 9.1million Euros on Cardozo, it is likely that Newcastle will be looking at a figure of at least £10-15million in they want to bring the player to St James' Park. The number 21 is Adrian Peralta, who was highly thought of a couple of years ago. He went to RCD Mallorca in Spain, but only lasted three months before he moved back to Argentina with Newell's. He has since transferred again, to Lanus, who currently lead the Argentine Apertura 2007. However, he has been in and out of the side and it seems unlikely another European club will move for him now. The 18 and 25 are not Peralta, they are in fact Mauro Cejas and Sebastian Arrieta. Both of them have also transferred away from Newell's, to UAG Tecos and Racing Club respectively. Thanks for the info - good work!